Located just 3.3 km away from Anjuna Beach, this is an offering of a four-bedroom villa that can accommodate up to fifteen people. The Wi-Fi-enabled property features a private swimming pool, and the retreat is ideal for those eyeing a lavish stay. Your Space Dyed in creamy exteriors and flaunting tiled roofs, this holiday home makes for a pretty picture and promises a comfortable getaway from your busy schedule. The property boasts a private swimming pool that is perfect for you to take a rejuvenating dip in on days you feel like skipping the beach. The pool is flanked by a small garden and a beautiful porch sit-out where you can hold a party afterwards Modish wicker armchairs and centre tables in the porch further accentuate the ambience. 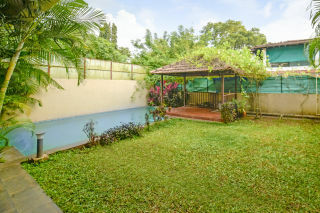 Inside, the villa has two living spaces, so you stay spoilt for choice if you wish to unwind with your travel buddies. The one on the ground floor flaunts modish sofas and tufted leatherette settees, making for the perfect space for you to kick back with a coffee mug and engage in interesting conversations. You can also organise movie nights on the first floor that boasts a wide flat-screen television. The abode also features an elegant dining area where you can relish your meals with your entire group. The well-equipped kitchen ensures you can prepare home-cooked meals if you wish so. Each bedroom is furnished with plush double beds with side tables and lamps, so you can engage in peaceful slumbers throughout your stay. The en suite washrooms are extremely modern, and feature enclosed shower panels. The property also has balconies, so you can step out and soak up some fresh air.